When the Nintendo 3DS is looking for an AR Card to start a game, it isn't searching for or recognizing its specific image-it's recognizing a color, and then spawning whatever comes next off of that. To prove this, AR enthusiast Super Jezmerelda created cards with the question-box design cut out, then framed certain colors within that window. It doesn't have to be an exact or even solid match. The key seems to be the black frame to provide a high contrast for the camera as it goes looking for the color. So, presto, a canopy of green from surrounding trees brings out Link. Red and blue from a blanket gave rise to Mario. 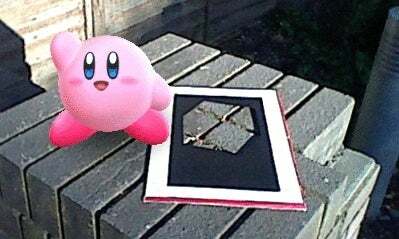 And a stack of greyish-pink bricks summoned Kirby. It doesn't have to be a perfect color match, either. Greenish-yellow was enough to start the targets/dragon game. You can see all these tricks and more at the link.